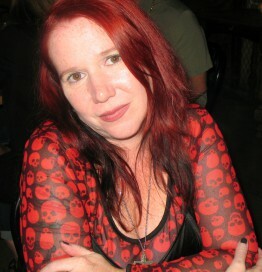 Trisha Baker is the author of the popular Crimson series—Crimson Kiss, Crimson Night, and Crimson Shadows. A collection of dark vampire novels, the books were originally published by Kensington Publishing in 2001 and were recently resurrected by Dark Oak Press. Crimson Revenant, the first new novel in over ten years, will be released in 2014. An expatriate New Yorker and quasi Gypsy, Trisha has traveled around the world, landing everywhere from Las Vegas to Prague. To supplement her writing income, Trisha has worked at everything from teaching to serving beer to thirsty Romanians at a small bar in Transylvania. Currently, Trisha works as a tour guide for Haunted History Tours in New Orleans and is hard at work at the next novel in the Crimson series—Crimson Resurrection.